Inspired by the diffraction of light , CARMEN experience allows you to control the color and its infinite variations in a perfect way. an antioxidant Agent allows to increase considerably the dyes and the gloss of CARMEN. The base cream is rich in fat derivates from vegetable extracts , CARMEN dyes diffuses uniformly into the heart of the hair fiber is preserving the hydrolipidic film. Attracted by the keratinous fibers Reflect Magn System fastens like a magnet to the surface of the hair to form a sheath that reflects light and amplifies the color and shine. • + 70% improvement in districamento. CARMEN is also , contains a perfume created by a large profumista of Grasse , in close collaboration with the colorist. The sweetness of the peach accompanies the preparation to lead the way , during , the delicate bouquet of white flowers or during shutter merges with delicate notes of musk. A subtle and delicate Alliance with attractively using the product. shades: an extensive portfolio of nuances , 96 divided into 10 + 6 , chromatique, series and 2 natural ranges: NATURAL COLD , natural , MAHOGANY , IRISÈ , GOLDEN VIOLINS , BLUE ASH BROWN , ROSSI , , SUPER WHITENING is AUBURN. • From 0 to 50% of white hair: selected tone + 20 OXYCREAM vol. • From 50 to 100% of white hair: selected tone + from a quarter to half of the base with the same height of tone + 20 OXYCREAM vol. If the desired color tends to a golden reflection blend with the natural. If the desired color tends to a cold reflection mixed with natural cold. 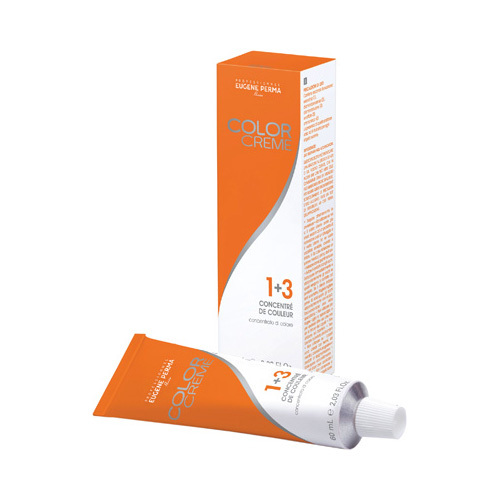 Lighten up to 3 tones with OXYCREAM to 30 vol. The super whitening blend 1 + 3 with the chosen OXYCREAM. The 1000 series lightens up to 4 , 5 tones with OXYCREAM to 40 vol and applies only on natural hair. The series of 2,000 lightens up to 4 , 5 tones with OXYCREAM to 40 vol and applies on 60% or more of white hair. The colours (purple blue green yellow orange red) enhance or neutralize a nuance Carmen. 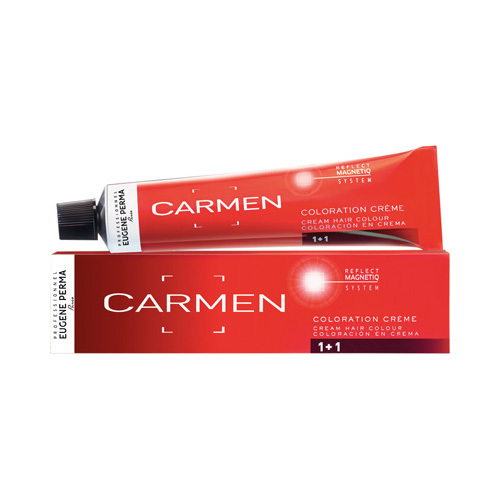 Prepare the initial mixture of Carmen 1 + 1 (60 ml of the chosen color + 60 ml OXYCREAM to 20 or 30 vol.). Add a fourth (30 ml) in half (60 ml) of the chosen color without adding oxygen. Leave on for 30 min. With a high percentage of white hair you may want to add color only when switching the length at the tips.